The First National Bank’s model train display. From Dec. 13-31, the train will chug over to our lobby because of the bank’s ongoing renovation project. This is a family-time holiday favorite. A performance by Schola Cantorum and the monks of Christ in the Desert Monastery. At 2 pm on Sunday, December 4, in the Museum Auditorium, the Santa Fe-based sacred-music ensemble joins the monks for this event, tied to the exhibitions Illuminating the Word: The Saint John’s Bible and Contemplative Landscape. Expect to hear the sounds of Advent, the ancient pre-Christmas period with its roots in the seventh century. Free with admission; Sundays free to NM residents. 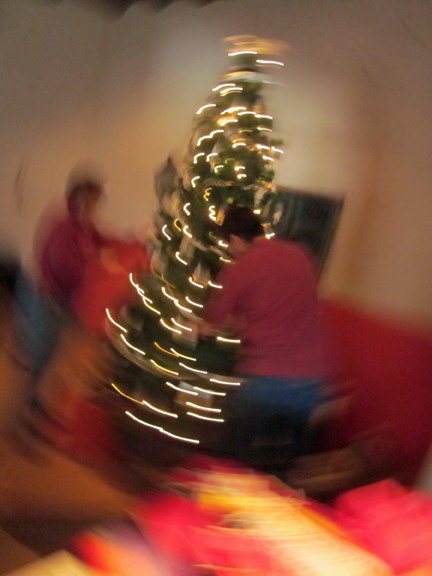 Christmas at the Palace. From 5:30-8 pm on Friday, December 9, enjoy an evening of hot cider, live music, piñatas for the children, and the annual visit of Mr. and Mrs. Claus, all in the legendary magic of the Palace of the Governors. A free, family event for all. 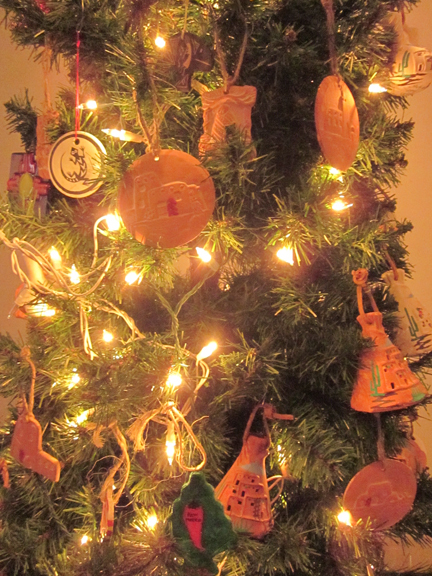 Las Posadas. 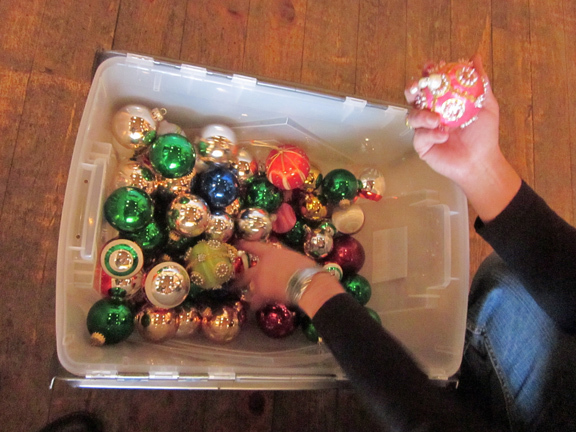 From 5:30-7 pm on Sunday, December 11, join the community for this annual favorite. The candle-lit procession of Las Posadas travels around the Santa Fe Plaza and concludes in the Palace Courtyard. This version of an old Hispanic tradition recreates Mary and Joseph’s search for a place to give birth to the Baby Jesus – and throws in a few devils for good measure. Stay for carols in the Courtyard, along with cookies and refreshments. Free and open to the public. Young Native Artists Show and Sale. On Saturday and Sunday, Dec. 17 and 18, children and grandchildren of the Palace Portal artisans will display their own creations in the museum’s John Gaw Meem Room. (Enter from Washington Avenue.) Pick up some nifty Christmas presents and support the next generation of Native American artisans. … Daniel Kosharek selected from a big bin of potential ornaments. 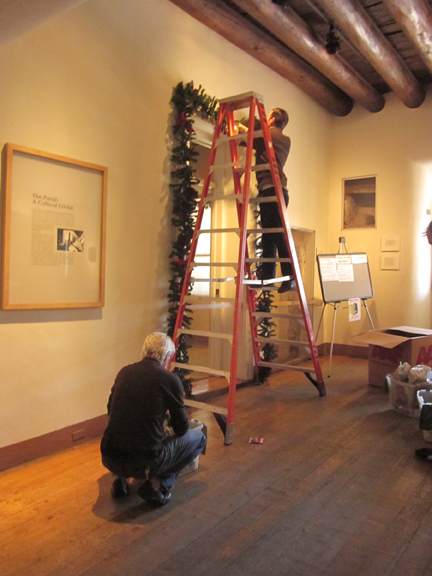 Pretty much half the staff — (from left) Director Frances Levine, Finance Manager Judy Morse, Administration Angel Carla Ortiz, Librarian Patricia Hewitt (partly hidden), and Photo Archivist Daniel Kosharek — got busy decking the hallway outside of the exhibition Santa Fe Found. 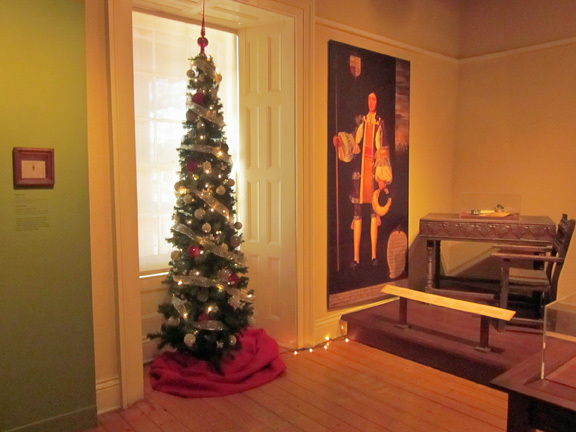 In the Palace’s Architectural Room (the room to your right as you come in the building’s main entrance), we always have a tree with decorations donated to us by the late former First Lady Dee Johnson. 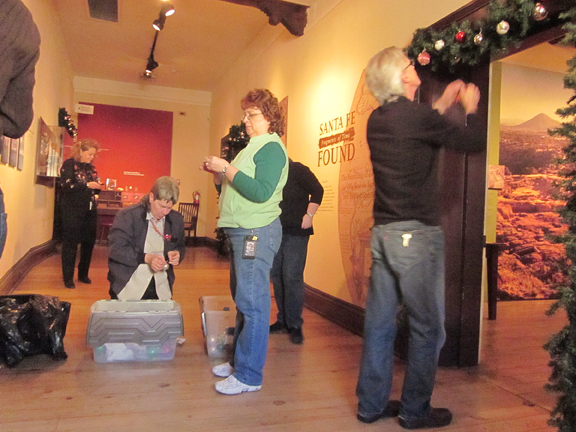 The ornaments were made by New Mexico artists, and it feels good to remember Mrs. Johnson’s generosity to the museum. 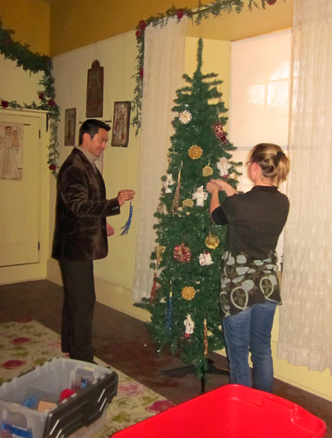 Curator Josef Diaz and Assistant Collections Manager Pennie McBride decorated this tree inside the Gov. Bradford Prince Room, which always has a Christmas-y feel with its ceiling garlands of greenery and roses. … they look like this. 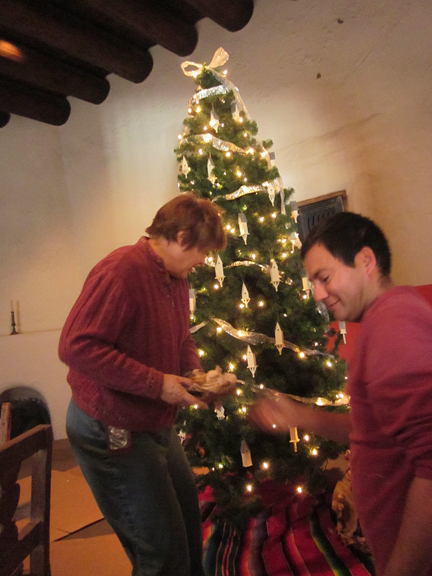 The holidays in Santa Fe are a special time. The aroma of piñon smoke, the farolitos, fabulous shops, and terrific exhibitions at all of the state museums (but especially ours — hey, we’re allowed some parochialism here). Stop on by. We’re open Tuesday-Sunday, 10 am to 5 pm, with free Fridays 5-8 pm. Sundays are free to NM residents, and children 16 and under are free every day. Come discover the child in you this holiday season. 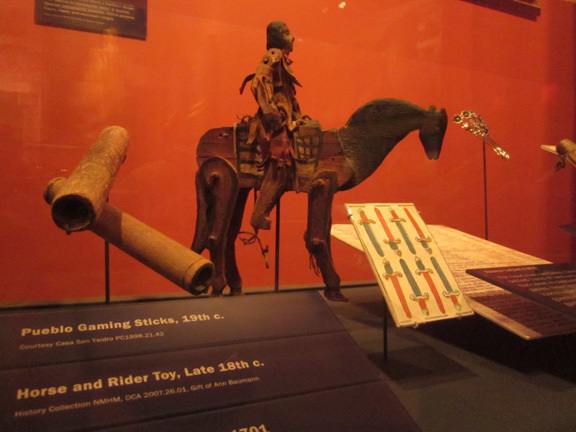 Observant visitors to our main exhibition, Telling New Mexico: Stories from Then and Now, may have noticed the late-18th-century horse-and-rider toy in an exhibit case with other playthings of the era. Extra-observant visitors may have noticed a name on the label marking who gave the toy to us: Ann Baumann. The daughter of famed artist and printer Gustave Baumann was an especially kind friend of the museum, which houses a recreation of her father’s Santa Fe studio in the Palace Press. (A video accompanying the exhibit includes an interview with Ann.) She also donated her father’s paper archives to the museum’sFray Angélico Chávez History Library. The role she played in her father’s artwork and the life she lived in a house bursting with creativity was detailed by Carmella Padilla in a 2009 El Palacio magazine article. “A home full of art was the only home I knew,” she said in the article. On view through March 18 at the Museum of Art is The Prints of Gustave Baumann. 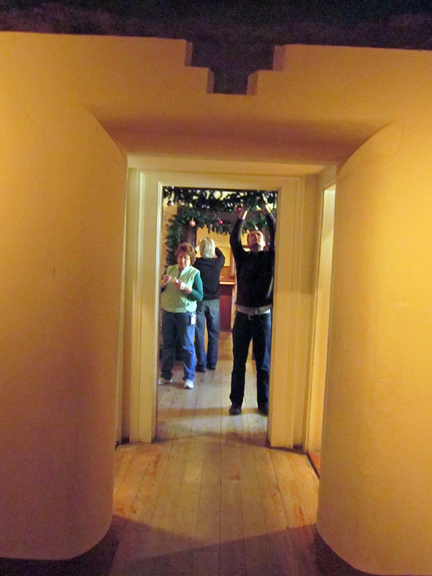 The Historic Santa Fe Foundation owns Baumann’s 1923 Santa Fe house and opens it for tours occasionally. Ann passed away earlier this month at her home in Santa Rosa, Calif., and we wanted to honor her time here. Here is a story about her that appeared in this week’s Santa Fe New Mexican. Below is an obituary prepared for her. We join those who knew her in wishing her well on this leg of her journey. Ann Baumann, philanthropist, social worker, and community activist, passed away peacefully with friends by her side on November 15, 2011, in Santa Rosa, California. Friends will miss her humor, frankness, compassion, and grammatical correctitude. Ann was born in Santa Fe, New Mexico to artistic parents on July 31, 1927. As a child she was introduced to poets, painters, patrons, musicians, opera singers, playwrights, and social activism. Ann attended public school in Santa Fe before her parents enrolled her in Sandia Preparatory School in Albuquerque. She left New Mexico in 1944 to attend Bradford Junior College in Bradford, Massachusetts. Upon graduation she returned to California settling in Pasadena while working at International House. Ann enrolled at the University of California Berkeley in 1956, earning her B.A. 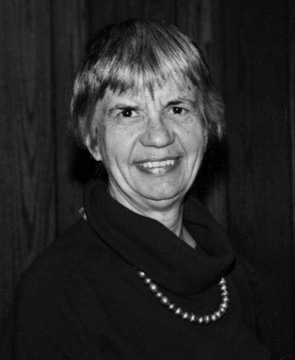 in Psychology in 1958 and her Masters degree in Medical Social Work in 1961. 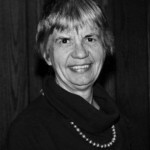 She was resident of Sonoma County since 1964, where she worked for the State of California and the County of Sonoma as a medical and psychiatric social worker. A believer in giving to those in need as well as to her community, Ann gave generously to various charities and worthy organizations. At the local level she was a patron of the Santa Rosa Symphony and a generous supporter of the Sonoma Land Trust. She did not forget her hometown and made generous contributions to the Museum of New Mexico Foundation, the Santa Fe Opera, and Historic Santa Fe, which purchased and restored her family home. The American Association of Blood Banks honored and saluted Ann “for noble generosity to the ill and injured over many years through the unselfish donation of 10 gallons of blood.” Ann was also honored by Bradford College for her commitment to serving and helping others. Her father, Gustave Baumann, was an artist now famous for his color woodcuts depicting the American landscape and her mother, Jane Henderson Baumann, was an opera singer, stage actress, and community activist. Ann safeguarded and promoted her father’s legacy with donations of his work to the British Museum; Cleveland Art Museum; Georgia Museum of Art; Herbert F. Johnson Museum of Art, Cornell University; Indianapolis Museum; Library of Congress; New Mexico Museum of Art; New Mexico History Museum; and the Worcester Art Museum. Ann was a charter member of the Society for Clinical Social Work and served on its Board of Directors. As a member of the local chapter of Soroptimist International, she served on its Board of Directors for three terms and was considered a life member. Ann was also a member of the Sonoma County Council for Community Services and the League of Women Voters of Sonoma County. A celebration of Ann’s life is planned for Sunday, December 11, 2011, between 3 and 4 p.m. at Friends House, Commons B, 684 Benicia Drive, Santa Rosa. Please RSVP to Doris Davidson at 707-537-0891 or 707-490-7055. Friends are encouraged to make memorial donations to charitable organizations of their choosing. In the days before the weight of our words fell to the skill of our thumbs, people did crazy things. 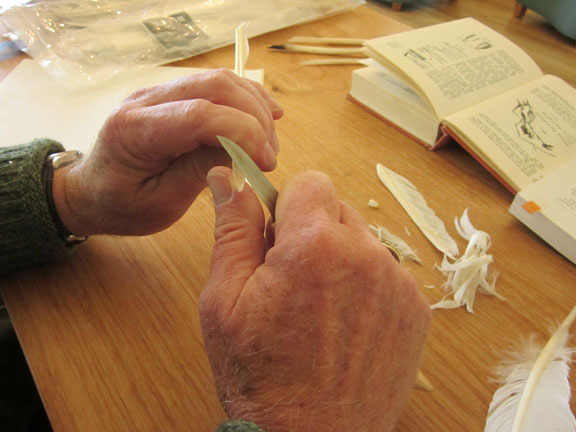 Some of them took goose quills, cut off the feathers, and fashioned the points into nibs. Some mixed powdered pigments with water; others purchased teeny bottles of ink. All dipped some sort of pen into some kind of ink, placed the points of said pens to paper (often calfskin vellum), and then wrote messages to one another. Messages with meanings greater than LOL or OMG. They called it calligraphy, and it’s an art celebrated in our new exhibition Illuminating the Word: The Saint John’s Bible. 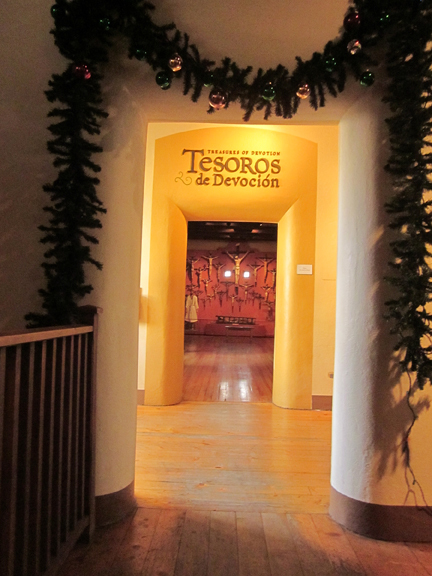 It’s also celebrated in our second-floor Gathering Space, where each weekend through the show’s closing on April 7, 2012, Albuquerque and Santa Fe practitioners of this dying art are demonstrating their skill at it. The calligraphers and bookbinders adding to the exhibition belong to Escribiente, Albuquerque’s calligraphy guild, and the Santa Fe Book Arts Group. They plan to be available from 10 am to noon and 1-3 pm on Saturdays and Sundays through April 7, though winter weather may occasionally interrupt those plans. 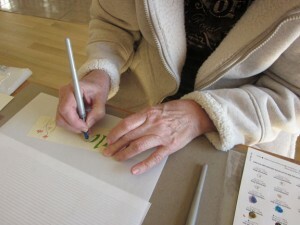 Keep an eye open during the week, too: Calligraphers sometimes show up and set up shop for the love of it. Take today (i.e., Thursday, Nov. 10). Three members of Escribiente–Catherine Hogan, Beth House, and Rick House–drove up from Albuquerque and worked away on a variety of crafts. 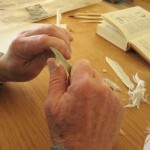 Rick, for example, was practicing his newfound skill of turning feathers into quills. 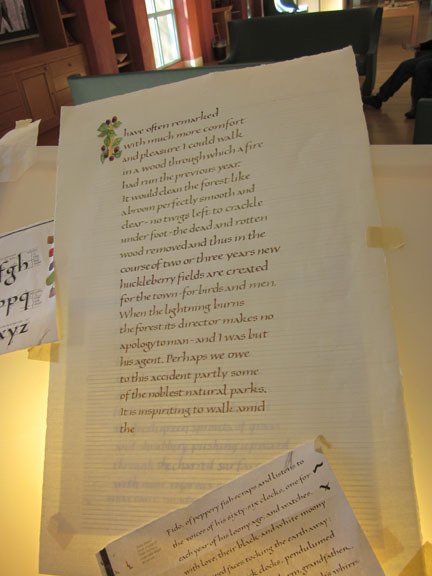 Beth was calligraphing a piece of writing by Henry David Thoreau–an ode of sorts to the benefits of forest fires. If you can’t be here when the demonstrators plan to be, but have a group of folks who might be interested in learning more about the book arts, call ahead and we’ll work to arrange a demonstration for you. For such requests, call Tom Leech, director of the Palace Press, at 505-476-5096. Whenever you come, bring your curiosity and your questions. 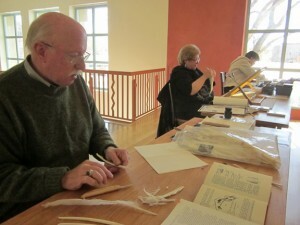 Not only are the volunteers good at what they do, but they love to talk about the book arts. Thanks, Rick Beth and Catherine (below, from left to right), for helping us bring another day of life to an art that deserves many more. Were you to spy them in a Santa Fe cafe, you might mistake Donald and Mabel Jackson for any other vacationing couple. But make no mistake: They are a power couple unlike any other power couple before them. As a child with extraordinary artistic talents, Donald Jackson imagined writing an entire Bible in the best style of medieval monks–with careful calligraphy and inspiring illuminations. Earlier this year, he inscribed the word “Amen” onto the final page of The Saint John’s Bible, a work that has been called the Sistine Chapel of the book arts. 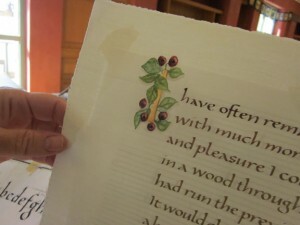 Donald Jackson, senior scribe to Her Majesty Queen Elizabeth’s Crown Office at the House of Lords, oversaw the project from the scriptorium he and Mabel created in Wales. There, a team of scribes and artists worked hand-in-hand on page upon page. 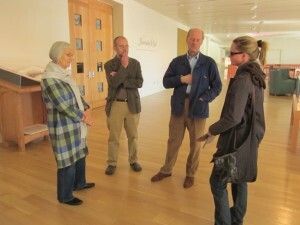 From left: Mabel Jackson, Palace Press Director Tom Leech, Donald Jackson, and assistant collections manager Pennie McBride outside the exhibition. 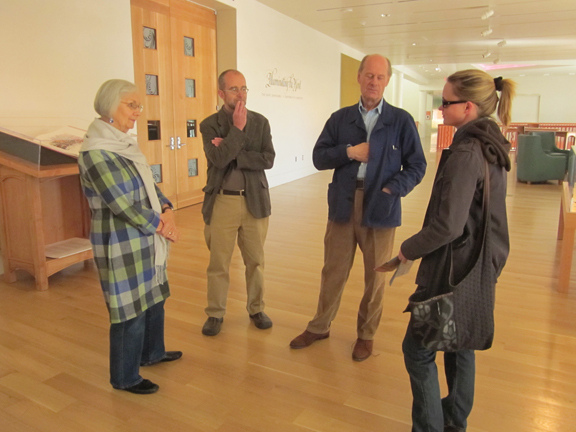 Forty-four of those pages are on view through April 7 at the New Mexico History Museum, and just this week, that otherwise ordinary-looking vacationing couple dropped by to see how the exhibition looks. Good news for us: They liked it. Donald was particularly interested in seeing how we displayed the creation that put the entire project into motion. 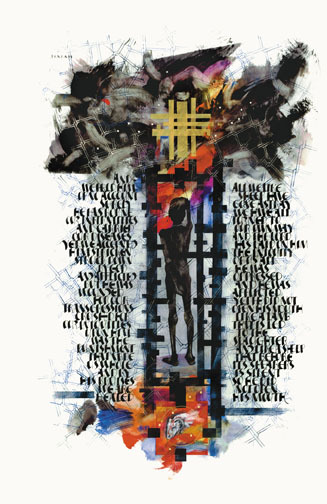 While at a calligraphers’ retreat at Ghost Ranch in 1994, he mocked up an art piece representing how he would approach doing a handwritten Bible. He later showed it to the Benedictine monks at Saint John’s University in Collegeville, Minn., and soon got their commission to tackle The Saint John’s Bible. 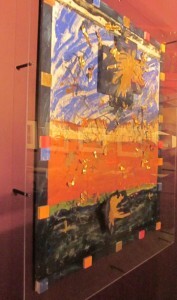 The piece is on display at the museum for the first time in the project’s history. “That’s come out well, hasn’t it?” he said upon seeing it near the front of our exhibit, Illuminating the Word: The Saint John’s Bible and Contemplative Landscape. Donald Jackson will talk about The Saint John’s Bible and his life in calligraphy at 6 pm this Monday (Nov. 7) at the Lensic Performing Arts Center. The lecture costs $15; a private $50 reception follows at the History Museum. Call 505-988-1234 or go to ticketssantafe.org for tickets. We walked around the exhibit chatting with Jackson, as fitting a preview as any to what Monday evening holds in store. Here’s a taste. On working through difficult sections of the Bible: “You grind your teeth. There was some reaction among the scribes. Some of Leviticus, for example, was quite heavy-going–very proscriptive and dark. One of the scribes, a woman, we were writing out something that was dreary and uncomfortable, and she said, `I just realized this is like the evening news. Every night there’s something horrible.’ You look at a newspaper today, you see war, atrocities, abnormalities. She realized that this was life. Suffering Servant, Isaiah 53, 54:1-8, by Donald Jackson, 2005. The Saint John’s Bible, Order of Saint Benedict, Collegeville, Minnesota. On the subversiveness of teamwork: “There were five scribes, plus me, at the scriptorium. That is a very unusual scenario. Nowadays, it’s counter-cultural, all working on one thing, all one script we’re trying to imitate. The word `artist’ in our society is synonymous with individuality. You had to be as different as you can be from the next person. … Our culture exploits that. It turns us against each other.